The 2014 Biomaterials Education Challenge will pit student chapters or teams against one another for the best 6th-8th grade outreach program with total prizes of $5,250 on the line. For more information, click here. For more information on Biomaterials Days events, click here. In a competitive process based on abstracts submitted to the annual meeting, the following students were selected to receive the 2013 STAR awards. Congratulations! 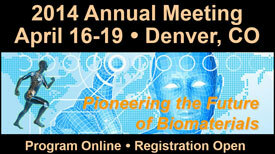 Four of the Society For Biomaterials Special Interest Groups are pleased to announce their Awards of Merit for 2013 annual meeting poster presenters. Jack Lemons to receive the 2015 Acta Biomaterialia Gold Medal! Jack Lemons, PhD, University of Alabama, has been selected to receive the 2015 Acta Biomaterialia Gold Medal. The award recognizes Dr. Lemons for his excellence in research, development and leadership in the field of biomaterials. Dr. Lemons is a past president of the Society For Biomaterials (1987-1988) and a charter member. He has also won the Society's Founders Award (1996) and the Clemson Award for Applied Research (1991). Please join us in congratulating him on this distinguished honor! The Awards, Ceremonies and Nominations Committee is pleased to present the recipients of the 2014 awards, below. For full text of the press release announcing the award winners, please click here. Major Patent Law Change Signed by Obama Friday Sept. 16, 2011.
promoting advancements in all aspects of biomaterial science, education and professional standards to enhance human health and quality of life. to advancing excellence in all aspects of biomaterial science, engineering and technology for promoting human health and well-being.